I’ve been trying to eat a more healthful diet since falling off the clean-eating wagon during the holidays and being run over repeatedly. And then there’s the blog. Someone has to sample my recipes before I share them, right? I’ve officially delegated that entire job to my husband, my children and whoever happens to be at my home or walking by . . . for now. And what about winter? Why do I seem to eat more during winter? It’s not like I’m preparing to hibernate or anything. We haven’t experienced too much cold weather here in the south (yet), but we have had an unusual amount of rain and cloudy days that seemed to turn into weeks. It could be downright depressing for a sun-loving girl like me if I didn’t have my citrus salad with toasted coconut and pistachios to cheer me up. It’s healthy, delicious and nutritious! I was going to call my salad a deconstructed citrus salad with toasted coconut and pistachios and citrus balsamic vinaigrette, but man, that’s a mouth full! So I just gave it a nickname. 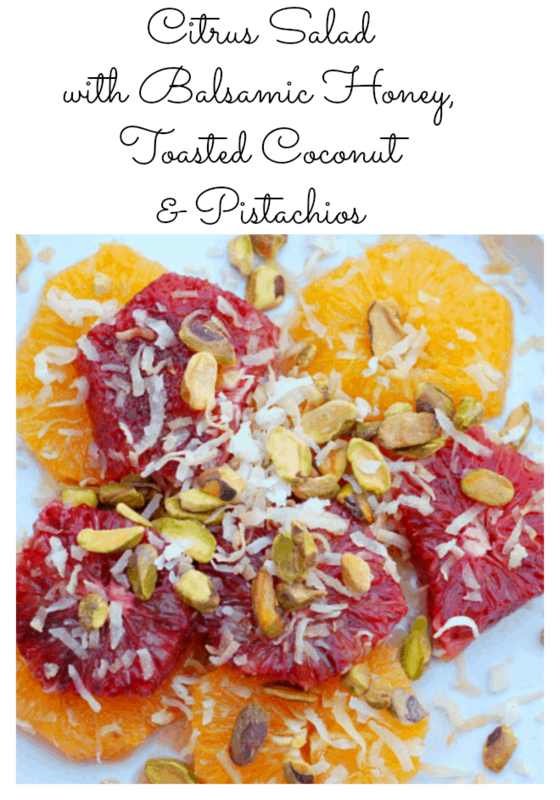 My citrus salad is light, refreshing and provides a crunch from the coconut and the nuts. The vinaigrette provides a smooth, sweet finish to this perfect winter dessert or snack. This recipe begins with blood oranges. I have no idea why anyone would include blood in the name of a food. Yes, I realize that the flesh of the orange is blood red. And I guess “ruby” was already taken by the grapefruit industry. Did you know that most blood oranges are grown in Mediterranean countries (Southern Italy in particular) and are often considered to be among the finest dessert oranges in the world? 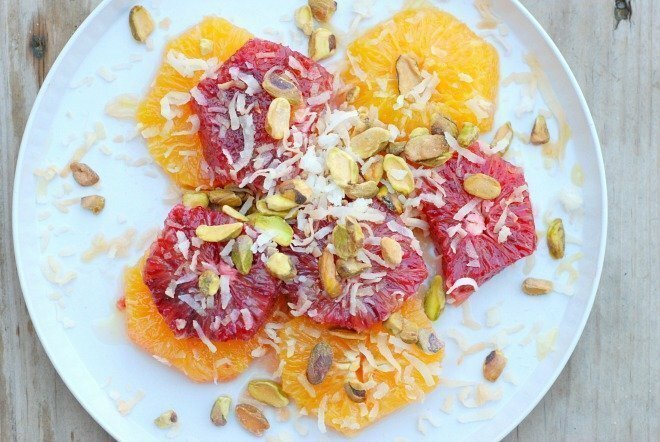 Blood oranges are in season from December to May so now is the perfect time to try them in my citrus salad. Bake for 6-8 minutes, stirring and checking to make sure the coconut doesn't burn. Combine olive oil, honey, fresh juices and balsamic vinegar in a tight-fitting lid. Shake to mix well. Peel oranges, removing any white pith. Cut into 1/4 inch thick slices. Place oranges on a serving platter. Sprinkle with coconut and pistachios. Helpful Hint: To remove the white pith easily, slice a thin strip off of the top and bottom of the orange. 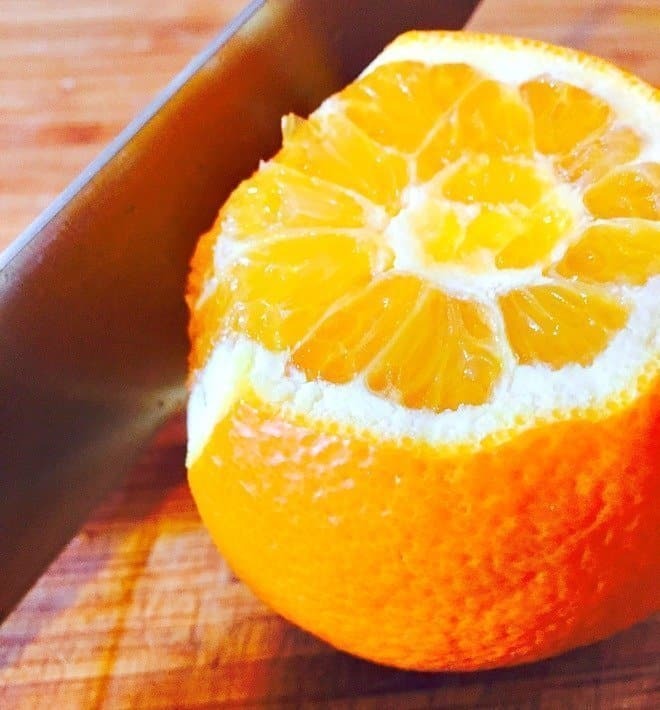 Follow the curve of the orange with your knife to remove the pith. 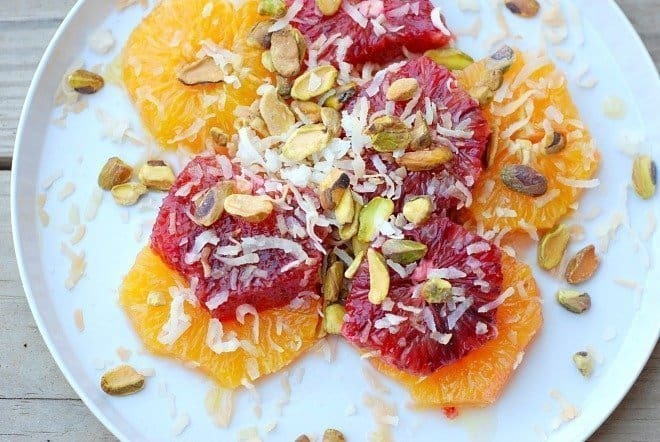 Have you tried blood oranges? What’s your favorite way to eat citrus fruits? ohhh this looks yummy! I don’t know I would have ever mixed citrus, coconut and pistachios without your encouragement but man it sounds delish! I’m such a nut lover. Pistachios are one of my faves, too. I agree, this is such a pretty dish! I love the way the oranges look together, and I am a firm believer that coconut makes everything taste better. I am looking forward to trying this recipe – thanks! Thanks! My husband doesn’t care for coconut and I don’t get it at all. Coconut DOES make everything taste better! This is a very interesting combo, but sounds amazing!!! I love toasted coconut and would love to try it with fruit…and the pistachios are the perfect addition! You’ll have to try it. It’s light, refreshing and very tasty! This is an interesting combo- I will have to try it out! I have actually never tried blood oranges before! Blood oranges are really good and I like the beautiful color they bring to this dish. Me, too! I love all citrus fruits. And this salad amps up the flavor. Thanks for stopping by! This looks sooooo good Alli! What a way to turn a boring salad into a more exciting one. I wish I was having that for lunch today. This looks absolutely incredible! Not only is it beautiful, but it looks like it tastes so good! I can’t wait to make this! Wow! Yum! I would eat anything with toasted coconut. This looks so good and a great way to brighten up the dreary days in the South! What a gorgeous dish, Alli, and what a great way to get some fruit in the wintertime! I love blood oranges, despite their name, and I cannot wait to try this salad at home because it sounds delightful! This dish is beautiful! And it sound delicious! I love pistachios too! This not only sounds delicious, but looks beautiful! Since I’m vegan, I’d replace the honey with maple syrup. Yum!